About Infinity Land & Cattle raising Registered Texas Longhorns. 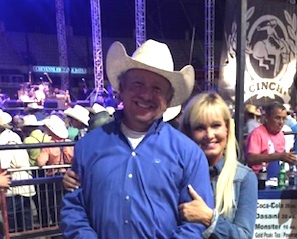 With God’s exceptional guidance and timing, Keith and Carla Blair became involved with the Texas Longhorn industry, but the truth is, the Blairs have always had a deeper connection to Longhorns than most breeders. Keith Blair grew up in Combine, Texas, working and learning from his grandfather, Dan Caylor. Dan, who owned his own business specializing in the trucking of sand to golf courses, also raised Longhorns at his ranch, Double D Ranch, in Waco, Texas. “I never paid much attention to their pedigrees back then,” says Keith. “I just enjoyed feeding them, looking at the new babies and being around them. He did have a bull named Power Stroke that I can remember. He was just a really cool, big bull.” Keith’s grandfather raised Longhorns for 25 years, until he passed away in 2009. While attending the Fort Worth Stock Show in January 2016 and walking through the various exhibits and buildings, the Blair family, including 13 year old Colton, came across the Eddie Woods Cowtown Classic Sale. According to the Blairs, something just felt right. With only a few lots left in the sale, the Blairs got a buyer’s number. They purchased their first Texas Longhorn right there when Colton put the winning bid on “Bright Eye,” who was bred by the late Mike Bowman. The Blairs continued with their cattle-raising heritage, and it was through their faith they realized that God had brought them back to the Longhorn breed for a reason. Keith began researching pedigrees, tip-to-tip measurements, and market values for registered Texas Longhorns through various websites. Carla enjoyed every minute with their first Longhorn purchase, making Bright Eyes the start of Infinity Land & Cattle Company. 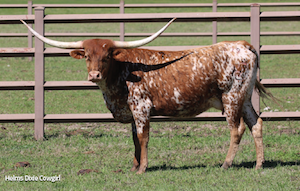 Eventually, they purchased an additional female from Dawn & Darin Divinia, located near them in Red Oak, Texas, and also re-connected with their fellow acquaintance and Longhorn breeder, Jim Eggleston of Star E Longhorns. While continuing with his pedigree research, Keith came across a bull being sold by Jim & Barbara Atwell through Martee Lancaster. Keith purchased Country Chex, originally bred by longtime breeder Joe Valentine. The couple also added a few females to the growing herd. “‘Pine Ridge’ has been one of our favorites since the day Tessa (Milsap) delivered her,” beams Carla. Jim and Barbara Atwell, of Royal Heritage Farms, encouraged Keith and Carla to research the Texas Longhorn Marketing Alliance. The Blairs became members and quickly heard about the 2016 Texas Longhorn Legacy Sale – the premier sale to add quality genetics to any breeding program. Brand new to the industry, they decided to attend and became the highest volume buyers of the sale. Keith, Carla and Colton went home with six lots from the Legacy Sale totaling $172,550. They purchased HR Slam’s Rose, the second highest selling cow in the Legacy Sale and consigned by Bill & Judy Meridith of Tallgrass Cattle Co. The Blair’s growing herd at Infinity Land & Cattle is comprised only of 80” TTT animals or animals expected to reach 80” TTT very soon. The newly acquired animals roam through either their 24-acre calving ranch in Hudson Oaks, Texas, and on their 188-acre ranch in Millsap, Texas, being hand fed and loved on every day. The first baby, born just before Easter Sunday church, will bear the Blair’s brand that is a combination of the infinity symbol and a cross. “We just plan to make our herd the best that it can possibly be,” says Keith. Infinity Land & Cattle Co.